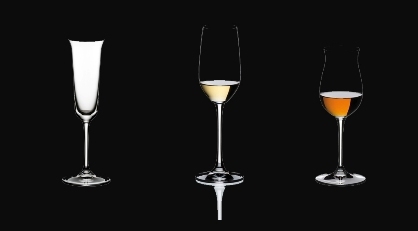 Riedel (pronounced Ree-dle) is the industry standard for stemware and decanters for the wine connoisseurs, it has been an illustrious history – family owned in Bohemia since 1756 (the same year as Mozart’s birthyear – it’s been that long!). With expert craftsmanship and a creative design team, their stemware and decanters are in high end restaurants and regular homes alike. It’s claim to fame is that the stemware was specifically and scientifically design so the first hit on your tongue accentuates the qualities of the grape or spirit that the glass was designed for. Enhance your experience with Grappa, Tequila and Cognac with these highly specialized machine-made crystal stems – it will be an eye opener! Founded in 1877, four generations of the R López de Heredia family have devoted themselves to producing exceptional and unique wines in Haro, home to the Tempranillo based Rioja wines. We will be closing the store early for a rare Friday night tasting. On Friday, April 20 at 8pm, we welcome Heredia’s World Export Manager, Maria Vicente to lead us through six marvelous wines from this world renown and historic estate in the famous Railway Station District. 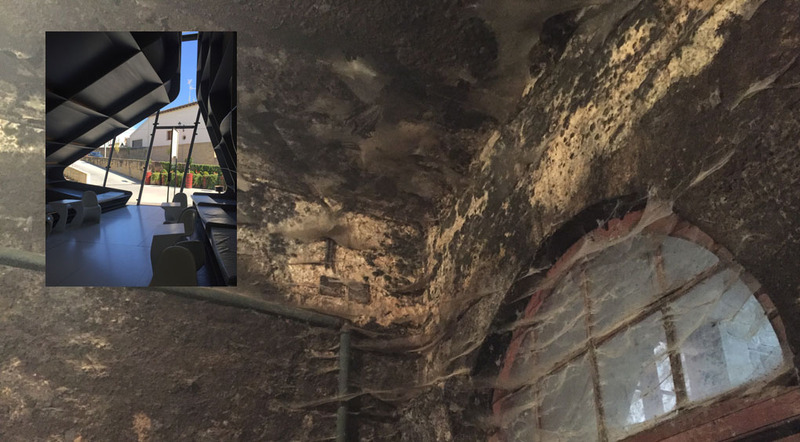 If you ever visit, you’ll be stepping back in time, the barrels have been well patched and in use for over a hundred years, the cellars are lined with cobwebs – all part of the ecosystem. We’ll be tasting a lineup full of gems – including the Gravonia and Tondonia Reserva Blancos, Cubillo Crianza, Tondonia and Bosconia Reservas, and then a rare treat, the 1995 Tondonia Gran Reserva. Book early to avoid disappointment for this special sit-down event. Pictured – the stepping back in time traditionally styled cob-webbed laidened cellars at Heredia. Inset – the modern entrance at Heredia (in the shape of a decanter) designed by the late famous Iraqi-British architect Dame Zaha Hadid. Veuve Clicquot and The Hardware Grill are pleased to welcome Bertrand Varquier, Winemaker from Veuve Clicquot! for an amazing 4-course Dinner – $150.00 per person on Wednesday, March 21st. Reception is 6:30pm, Dinner at 7pm. 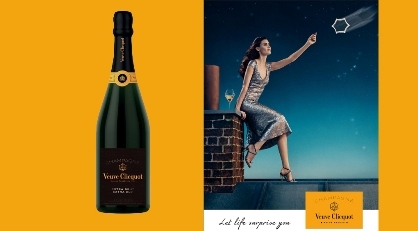 The event features 5 Veuve Champagnes, including the launch of the brand new “Extra Brut Extra Old” Champagne (pictured). Available seats are limited, so book early to avoid disappointment. You will be able to order the Champagnes tasted at the event through deVines, which includes the Yellow Label Brut, the new Extra Brut Extra Old, NV Rose, 2008 Vintage Rose, and finally for dessert, the Demi-Sec. 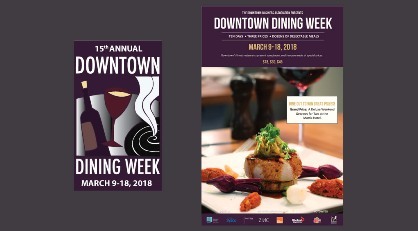 For 15 years now, many of downtown Edmonton’s best eateries have joined together for ten days every March for the Downtown Dining Week. With two course lunches for $18, three course dinners for $30, and an Executive Dinner for $45, we are treated to all kinds of culinary choices from many many ethnic backgrounds. 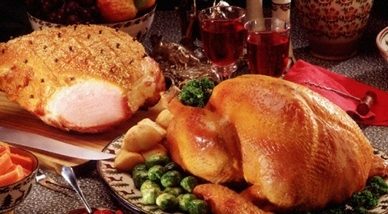 At this writing, 37 restaurants have signed up for this popular event. This is an amazing opportunity to experience fine dining with exclusive menus designed specifically for this event which runs from March 9-18. Bring along all your friends and family and taste the best of Downtown Edmonton. Reservations highly recommended.